Sometimes it just doesn’t seem fair. Celebrities seem to have it all – fame, money, talent, and enviable social media power. Many celebrities have amassed a gigantic and engaged social media following that builds their voice, excites their fans and strengthens their overall brand. Fortunately, you don’t have to include being a platinum recording artist or award-winning actor to learn from their actions. In fact, many of the elements that have helped today’s coolest celebrities to secure strong social followings are ideas that any brand can tap into as well. These three women – Ariana Grande, Taylor Swift, and Nicole Richie – showcase some of the steps any entity can take for a more compelling social presence. Yes, many of Ariana Grande’s social media posts come from concert rehearsals or promotional events. But interspersed with those missives are the type of posts you’d expect from a 21-year-old who loves to tweet. She chats with her friends and gushes about her boyfriend. She snaps lots of selfies and frequent photos of her dog. Most evenings she wishes her fans good night. 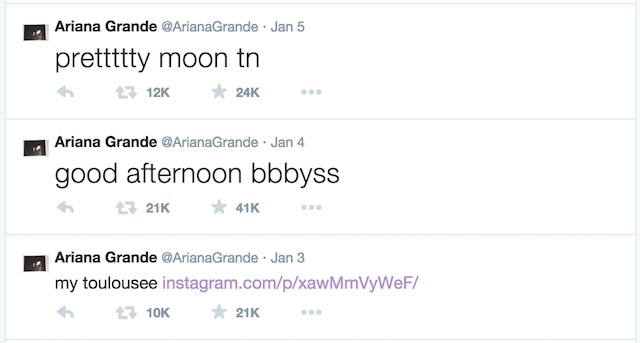 On Twitter and Instagram, Grande seems to be unfettered by a PR team or concerns about image. Her tweets are informal, and based on her spelling choices are not being vetted by a team. She does sometimes share updates from her promotional efforts, but they still have the feel of being just another day at work rather than a calculated marketing plan. This gives extra value to her interactions with fans, since they read like genuine messages from an individual, rather than the canned responses a brand sometimes has to make. Brand Takeaway: Misspellings and random grammar probably won’t work for your brand, but providing your audience with an authentic, behind-the-scenes look at your brand can showcase that you’re human (and even fun). Incorporating a personal touch to the routine interactions can help create a better sense of community and build loyalty. Brand Takeaway: Swiftmas is a great example of how to give recognition to the most loyal fans. Brands frequently pay lip service to community-building, but their moves in that area often seem half-hearted. Taylor Swift dove headfirst into an effort to sincerely thank the people who have felt the strongest connection with her, both as a person and as a musician, and have actively worked to be informal brand ambassadors for the singer. Gifts are an act of generosity, and the unexpectedness of having a personal interaction with somebody they admire helped make Swiftmas a huge social sensation. Many of the popular photo networks have an aspirational quality. People share their best side and present the image that they want others to have of their life. 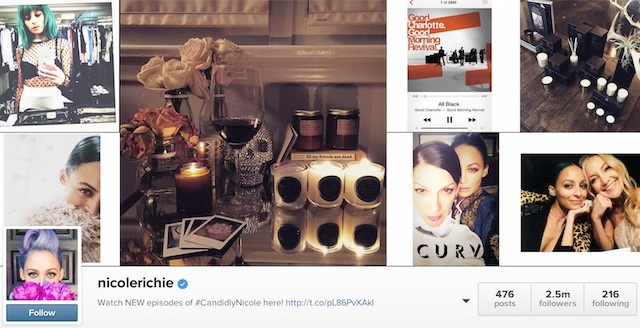 That element of exhibitionism could explain why Nicole Richie, a reality television personality and fashion influencer, has been so successful with Instagram. Richie has used her social photos to show snaps from her day to day celebrity life while still reflecting her own quirky personality. Some of the photos are casual shots of her family, but many also promote her latest projects and appearances. Her fashion choices are edgy – not everyone can pull off blue hair – so even when it might be an ad, it’s hard to not want to see what she’ll be wearing or doing next. Her Instagram feed reflects a unique style sensibility and a sense of goofy fun that has secured her many devoted fans. Brand Takeaway: The big lesson here is that it’s okay to be different. If your brand has a hard-rocking edge, then put that on display. If your business is a little weird, show that off to the fullest extent. Personality and a distinct outlook stand out on social just as they do in person. The key is to make your style presentation sincere. Just as the teenagers trying too hard to be cool will automatically fail, forcing a personality that’s not natural to your brand will most likely alienate or confuse your followers.